A man walks toward the State House in Augusta earlier this month. It’s an unusually busy end of the week at the State House. Here’s a quick rundown as the Legislature is starting to move some consequential bills to fruition. The governor’s supplemental budget is heading for passage with only a few changes, including taking no action on a shuttered Washington County prison. Gov. 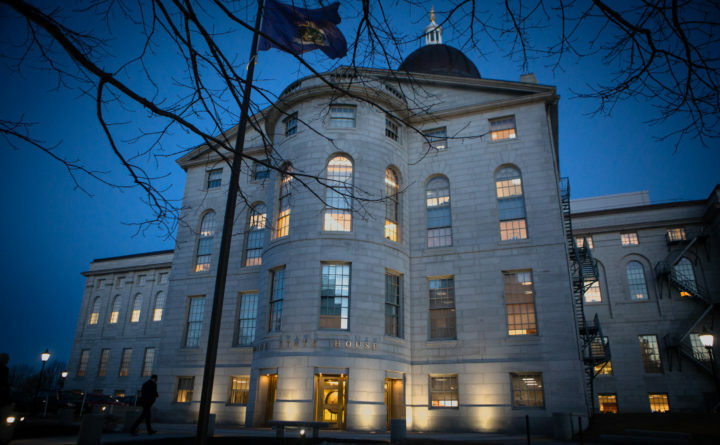 Janet Mills’ relatively minor supplemental budget was approved by the Legislature’s budget-writing committee on Thursday with only slight changes from the original proposal, sending it to the full Legislature for votes soon. The $7.5 million package mostly moves existing funds around. It would still fulfill a campaign promise from the Democratic governor by repealing the state’s two-year limits on Medicaid coverage of treatment with methadone and suboxone for opioid addiction. The methadone limit dates back to 2013 and mirrored the earlier suboxone limit. However, the biggest item that is out of the budget proposal is the Mills administration’s plan to reopen the Downeast Correctional Facility — which was closed in a rushed fashion by former Gov. Paul LePage in 2018 — as a pre-release center. It still is likely to happen as part of a standalone bill that will go through the Legislature separately. CMP has other controversies of their own, including a current proposal from the Maine Public Utilities Commission to cut the company’s profits because of lagging service and CMP’s controversial, $1 billion proposed transmission line from Quebec to Massachusetts via Maine, Mills signed onto it formally last week after a benefits package was unveiled and legislation could be forthcoming that is aimed at undoing the project. Both CMP and Emera are the subject of another legislative proposal that would create a new authority to buy the companies’ infrastructure and create a consumer-owned utility. It’s going to be a busy few months for utility lobbyists in Augusta. Changing election practices will be the focal point of legislative committee hearings this morning. The two most consequential bills up for legislative public hearing are LD 418 and LD 816, which propose replacing the U.S. Electoral College system for presidential elections with a popular vote. The largely symbolic proposals from Rep. Deane Rykerson, D-Kittery, and Senate President Troy Jackson, D-Allagash, would do away with the electoral-vote system that currently dictates who is elected president. The bills would require multi-state agreements to adopt the method by states who hold a majority of the country’s electoral votes, so passing one of the bills won’t make anything happen immediately. They figure to face lots of opposition, largely from Republicans who worry that Maine’s impact on presidential races would be diminished. After those events, the committee will launch into work sessions on other election-related proposals, including a bill to increase the number of signatures required to receive public campaign financing and a bill to include candidates’ nicknames on the ballot. Hearings before the Committee on Veterans and Legal Affairs begin at 9 a.m. Listen here. — The governor enlisted Maine in a group of states that have committed to abiding by the Paris climate change accords. Mills announced Thursday that Maine will become part of the U.S. Climate Alliance, which aims to reduce carbon emissions by 2025 according to a key tenet of the Paris agreement, an international 2015 pact the U.S. left under President Donald Trump. The move largely represents a philosophical shift from LePage, who effectively put the state’s climate response on hold as research emerged showing the Gulf of Maine has warmed more in recent years than 99 percent of the world’s oceans. Meanwhile, legislative Democrats have rolled out ambitious climate proposals, including a proposed carbon tax from Rykerson that faced opposition at a public hearing on Thursday and was changed to a study bill by day’s end. Mills seemed skeptical about the carbon tax, noting to reporters no other state has implemented a similar tax. — A conservative lawmaker’s effort to ban “political or ideological indoctrination” in Maine schools is almost certainly doomed. The Legislature’s education committee voted unanimously Thursday to recommend against passage of the bill from Rep. Larry Lockman, R-Bradley. Committee members suggested that the matter is best handled by local school officials, and the Maine School Management Association agreed to send a note to all Maine school districts urging them to ensure that “one-sided ideology” isn’t taught. — Top Navy officials have given conflicting answers to a Maine senator’s questions about safety. At a Feb. 12 hearing of a panel of the Senate Armed Services Committee, Sen. Angus King, I-Maine, expressed alarm over recent revelations concerning two deadly collisions of Navy ships in the Pacific in 2017. ProPublica reports that, in response, Navy Adm. Philip Davidson wrote a Feb. 21 letter to inform King that the Navy counted as “complete” 91 of the more than 100 reforms it had promised to make in the months after 17 sailors died in back-to-back crashes with civilian ships in the summer of 2017. It is a claim directly contradicted by Adm. Bill Moran, the No. 2 man in charge of the Navy. Moran told ProPublica this week that, in fact, none of the promised reforms had been completed. Moran said work had started on 91 of what he said were 103 pledges to, among other things, provide more sailors to under-manned ships in Japan and stop ships from sailing without complete certifications regarding their navigation and war-fighting abilities — both issues in the two 2017 deadly collisions. — Attorneys for a man accused of shooting a Maine deputy began efforts to have a confession excluded from an upcoming murder trial. Attorneys for John D. Williams, 30, of Madison claim that Williams only made incriminating statements to police in the case because those who arrested him had previously “ beat and pummeled” him, and because of the effects of opioid withdrawal. The first police officer to reach Williams in the Norridgewock woods to end a three-day manhunt last April testified Thursday that the accused killer resisted giving his hands up for cuffs, making it necessary to strike him in the face. Williams’ attorneys also presented witnesses who testified that he was going through withdrawal from drug addiction, which made him susceptible to a false confession. It’s the first day of March. How many people have already accosted you with the “in like a lion and out like a lamb” weather maxim? But I grew up with the whole lion and lamb thing, so I did a little quick internet research as part of our ongoing efforts to make Daily Brief readers the most well-informed and musically savvy participants in any conversation. The internet was profoundly unhelpful on this front. Wikipedia pretty much dodged the issue, writing it off as “a common Pennsylvania saying.” So are “pass the pretzels” and “why did the Steelers lose to the Patriots?” Not helpful. The Farmer’s Almanac is equally unhelpful. Thanks, but we know the weather in March is “changeable.” It’s changeable in every other month too. But the one I latched onto was astrological in nature. Leo, the sign of the lion, is the rising star at the beginning of March. It gives way to Aries, the sign of the ram, is the rising star when March turns to April.